You’ve probably seen videos of people smoking hookah—or something similar—and doing some incredibly impressive smoke tricks. If you want to learn how to do these tricks, you aren’t alone! 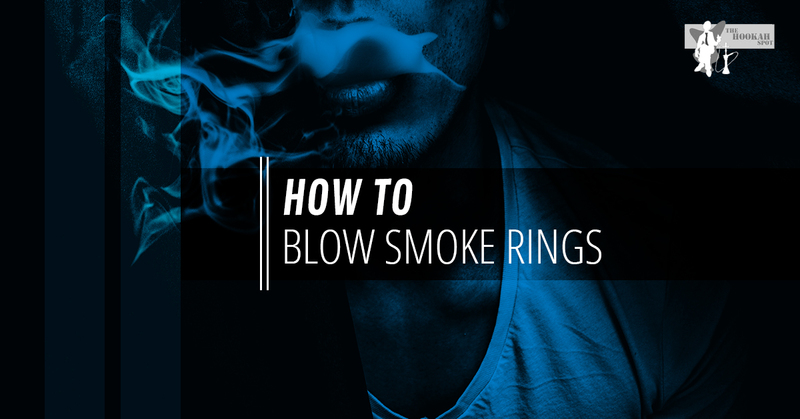 Today, we want to share our top tips for blowing smoke rings. Keep in mind that nothing beats good, old-fashioned practice, but hopefully, our advice serves as a good start. Read on to learn more from the hookah enthusiasts at The Hookah Spot! If you want to get the feel for blowing a smoke ring without all the nitty-gritty details, we do have a cheat you could attempt. When inhaling from the hookah, gather as much smoke as possible in your mouth without technically inhaling it. Next, create an “o” shape with your lips. While gently blowing smoke out, lightly tap your cheek. This should be a good start! Of course, if that doesn’t work, there are other ways. You can also curl your tongue back and flatten the front part so that the tip is touching the bottom of your teeth. You can push the smoke ring out of the “o” shape by pushing your tongue forward. The traditional smoke ring is easy enough to master with practice! Start by partially inhaling smoke and keeping most of it in your throat. You don’t want all of it in your mouth, as you will have little control over it once you start attempting to blow the rings. Keep in mind that getting the smoke in the right area may take practice; some people cough quite a bit at first. Next, move your tongue towards the back of your throat. Focus on letting the back part rise as the tip of your tongue points to the bottom of your mouth. The point of this is to push the smoke back away from your lips. Then, make an “o” shape with your mouth. The shape matters! If you don’t make it round enough, you won’t see any rings as a result. Once you make the “o” shape, stick your lips out as if you were making an “oo” sound. Make the “o” as big as possible without making yourself uncomfortable. You will need to move your lips a bit! While this will look a little silly to watch, at first, it absolutely looks cool when you start successfully blowing smoke rings! Finally, start pushing out small amounts of smoke. We recommend doing this by contracting the back of your throat and pushing out air through your lips. This feels like a bit of pressure that is followed by a nice puff of smoke! You don’t want to use your vocal chords at all, so try to avoid doing so when blowing smoke rings. Also, focus on not moving your lower jaw. You can start blowing more advanced smoke rings once you have this technique mastered. Keep your lips as still as you can while you push air out, as well. The hardest part is remembering to keep your tongue back while having enough smoke to form a ring. This will take time to get just right. If you are ready to master the art of blowing smoke rings, then why not practice with us? Our shisha produces delicious flavors that are fun to play with as you master your smoke tricks. We’ll happily take up to three people per hookah, so stop in with your friends today! The Hookah Spot is Columbia’s top choice when it comes to the finest shisha and hookahs available. We look forward to seeing you and watching you perfect your tricks!